Glen Guarino giving a design presentation at the main bench. The final day was another very busy one. The young man watching with his mother in the photo above had stopped by my bench for a while shortly after the doors opened and tried a number of different tools. He's very interested in hand tool woodworking and will be visiting Lie-Nielsen Toolworks this summer. He's clearly on a mission. I think we can expect to see him exhibiting at a future WoodExpo. Several times throughout the show, people said to me, "That's just like that guy on PBS with the hat who uses all the hand tools!" I'd pull out my copy of The Woodwright's Apprentice and say, "You mean this guy? He's one of my heroes!" I'd explain that I built my workbench from the first project in the book, and that it was practically a whole course in hand tool woodworking by itself. 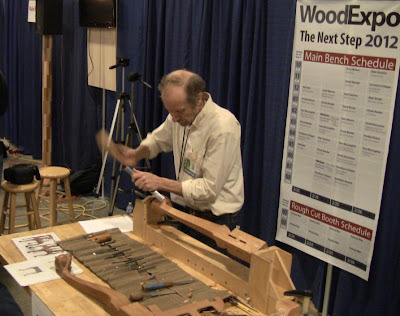 Al Breed, SAPFM member and another of my woodworking heroes, did several presentations Sunday. He demonstrated ball-and-claw carving, working with incredibly effortless speed. When I tell people about Al, I always describe him as the guy Sotheby's calls when they need a reproduction of a $2 million antique. He really is that good, museum-class skills and knowledge. 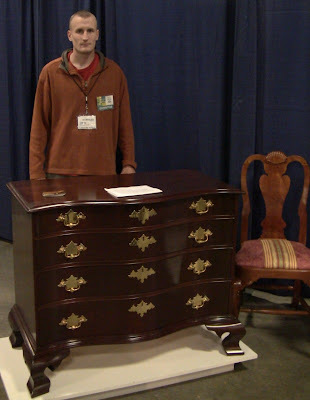 I've taken a couple of classes from him, and am building a reproduction Townsend document chest with him through the Guild of New Hampshire Woodworkers. He's also very generous with his information. He let me copy his carving vise and post it here; that's the one I used at the show. Any time spent with him is like drinking from a fire hose. Al Breed at the main bench. His carving vise looks just like mine! The show was a success on multiple fronts. Several people sold exhibit pieces and generated leads. I think I convinced a few people to try working with hand tools, and we'll pick up some new SAPFM members. I sent people to Freddy Roman for restoration work and balusters, to Mickey Callahan for furniture pieces, including his beautiful corner chair, and to other exhibitors representing various schools. I connected up with the manager of the Woburn Woodcraft and discussed offering my Intro Hand Tools classes there. Mike McCoy told me the thing about going to shows is not necessarily what happens during the show, but the residuals that come weeks or months after. Making connections that turn into later business can be even more important than immediate sales. I even had a couple people ask me how much it would cost to make a foot stool like the one I was building. I sent them to Mickey since I'm just a hobbyist for now, and you don't want to take on work unless you're sure you can deliver. One of the fun things was seeing people respond to the demo. Some are engaged as soon as they see the tools, but many aren't. There's a distance as they walk by, keeping outside the zone of engagement as they look. I look up from my work and say hi, watching the non-committal skepticism as they try to figure out what I'm selling. They stop and watch, still outside that line, then move closer, fascinated by the curve of the leg in the vise, the smooth grain of the walnut glowing under the spokeshave. I start explaining what I'm doing, offer them the spokeshave and assure them they won't hurt the piece. Even the ones who don't try it start to pay close attention. The real transformation comes when I explain that I do it all with hand tools. However crazy they might find that, there's always a genuine respect for the skill involved. By the time they're ready to move on, having watched and listened now for 5 or 10 minutes, even the most jaded ones are smiling, thanking me and shaking my hand. Steve Skillins with his beautiful mahogany serpentine chest that sold Friday, and his Queen Anne chair. I had seen this chest at Phil Lowe's when I demonstrated at the Lie-Nielsen hand tool event there; Steve is one of Phil's students. 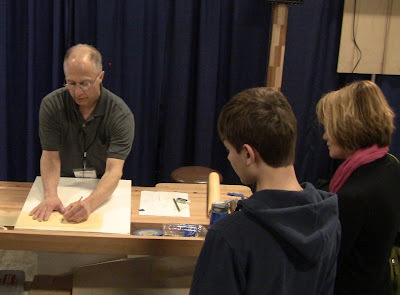 SAPFM member Roger Meyers demonstrating line and berry inlay. 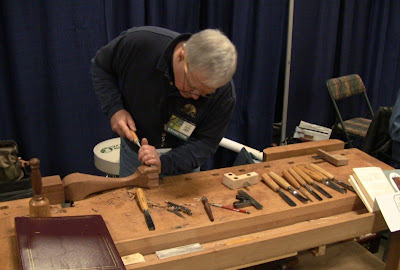 Mickey Callahan carving a ball-and-claw foot. There certainly was a lot of leg carving going on. Thanks for a great WoodExpo, Tommy! Thanks again to Tommy MacDonald for giving us the opportunity. 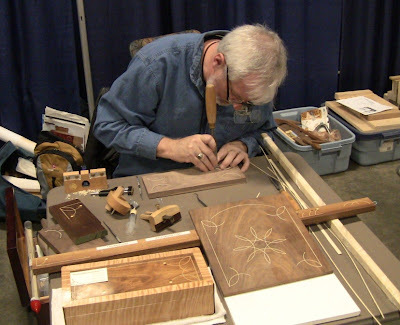 The last of the WoodExpo organizers I haven't mentioned yet is Neil Lamens. Unfortunately, right before the show health problems prevented him from attending after all the work he had put in. But thanks to his efforts and the rest of the WoodExpo crew, I think it was a real success. I'm beat after four days of standing at the bench. It'll take me a week to recover. But it was a blast, and I look forward to doing it again. It was a great way to spend a couple days of vacation and a weekend. As we wound down, Glen Guarino and Kevin Mack were very flattering. 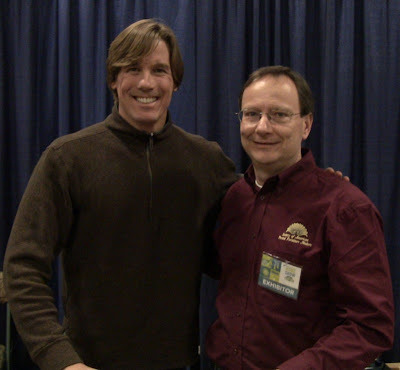 Since Glen had liked my Gramercy Tools rasp, I gave him my copy of the Tools For Working Wood retro catalog. He was very appreciative and said, "We should definitely keep in touch!" You know, with a guy who exhibits at various museums and high-end shows and galleries. Kevin paid me the highest compliment when he came over to see Mickey and said to me, "Was that you did that foot stool all with hand tools? Awesome! I could never do that!" This from a guy whose magnificent Federal pieces have won best-in-show three out of the past four years at the Providence Fine Furnishings Show. Once again, the opportunity to spend time with people like this is priceless.